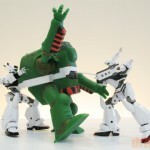 Attention toy-nerds: Robert Duban is back, and this time, he’s out for justice. Justice for the long-neglected manufacturer ROBIN, whose profile is the latest to grace the ToyboxDX Datafiles. Heavy drinking, hookers, firing squads, and bottom-of-the-barrel toys. It’s all here, just how you like it. Tune in, turn on, and party hearty “Robin” style. 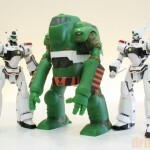 Alright-y… what’s green, 8 meters tall, weighs over 12 tons and ships in a plastic bag for 5,000 yen? 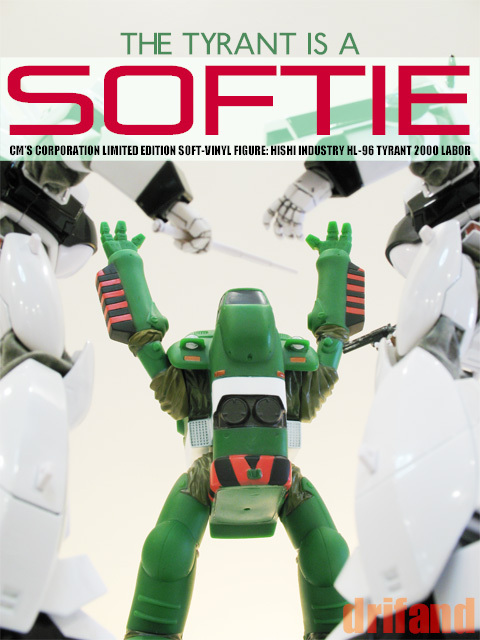 The answer is none other than CM’s Corporation’s soft-vinyl figure of the slightly goofy but oh-so-nicely-designed Tyrant 2000 worker labor as featured in the Patlabor anime. 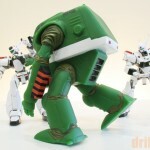 Made to be ‘in-scale’ with its recent Brave Gohkin Patlabor, the lovable green hulk was releasd as a limited edition of 1000 pieces, with a smaller run of 500 pieces for a brown-colored variant. 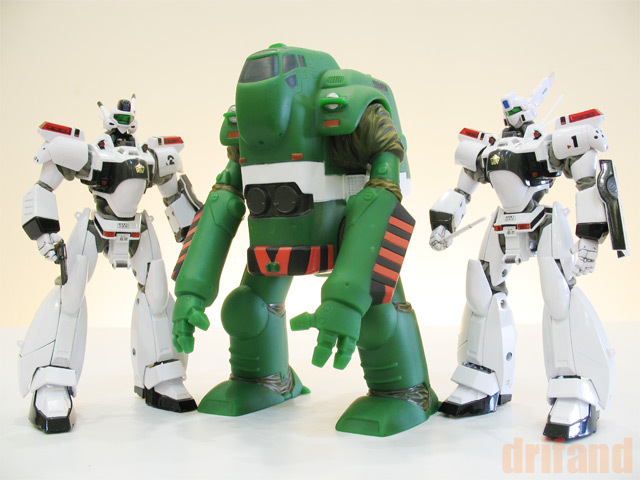 Even at a relatively steep price of 5,000 yen (steep to the sofubi-uninitiated), it must have sold pretty well because CM’s has just announced another run of 500 unpainted Tyrants at the same price. No doubt customisers will have a field day with it, adding working joints and cloth shrouds, etc. For myself, the Tyrant is a first of sorts: I was compelled to buy my first modern sofubi mainly because I had so enjoyed the diecast rendition of the Ingram, I simply had to give it a shelf companion. Afterall, who knows if a diecast Griffon or Zero will ever be released? The Tyrant indeed shipped in a barebones plastic bag with a printed cardboard topper. I was aware of such minimalist ‘packaging’ for even the rarest hobby-show sofubis, so I wasn’t in the least shocked. Being soft and pliable, the toy is very unlikely to become damaged even if the shipping box gets mangled enroute. As can be seen, the Tyrant is a hulking piece of machinery, at least a head taller and twice as massive as the sleeker Ingram. The Tyrant is molded in a pleasant shade of medium green, although nowhere near as solid looking as the publicity photos. 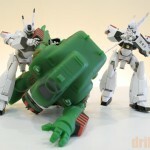 The level of molded details is pretty good; panel lines, rivets and mechanical parts appear crisp and well defined. Painted details are neat enough but some areas do appear slightly sloppily applied, especially on the white band surrounding the body. One of the grey windows on my toy had a definite fingerprint on it. Not too noticeable anyway. In the TV and first movie, when a Tyrant runs amok (whether because of a wayward operator or the virulent Hyper Operating System), it can be quite a handful. Typical engagements require at least 2 Ingrams working in concert to subdue the beast. As usual, Ohta provides the muscle while Izumi gives the coup de grace with the stun stick. That is, if the labor doesn’t rear its head again while under the sinister control of HOS. 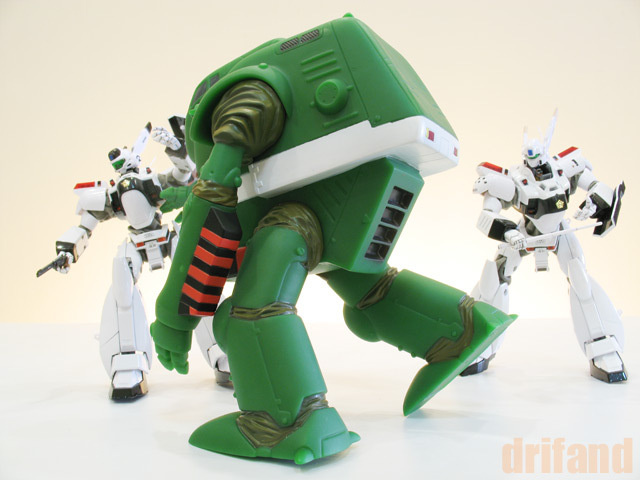 With its limited, single-plane articulation (shoulders, elbows and hips), the real appeal of the figure is probably its realistic industrial design â€“ a brilliant aesthetic touch seen throughout the lot of Labors created by Yutaka Izubuchi and the Headgear team. One wonders about what could have been if only Bandai had made and sold affordable sofubi figures of these strangely likable work site creatures back when the series was going strong. Today, the realisation of this dream would mean either miniscule gashapons… or more 5,000 yen rarities. I guess I ‘ll just have to take what I can get. DMS 052: Tarkarama: Tekkaman, Tark, Sark and Sork!